Get 100 4×6″ prints for just $10 shipped with the Snapfish coupon code. Add 100 prints to your shopping cart and use code MEM100PICS . 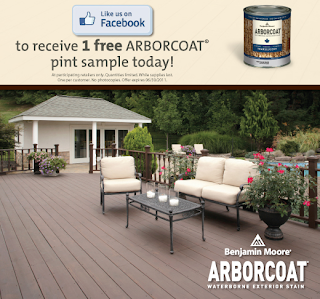 Offer good through June 6, 2011. Like Diet Coke on Facebook HERE and get a $1/1 coupon. You can find a list of Meijer sales/coupon matchups HERE. You can find a list of CVS sale/coupon matchups HERE. You can find a list of Walgreens deals HERE. Go HERE to score a FREE sample of Disney themed Pull-Ups Flushable Moist Wipes courtesy of Walmart! *Allow up to 4 weeks for delivery. Go HERE to print a $5/1 Gerber Good Start formula coupon. I just rec’d an email from Old Navy offering additional savings on clearance items through Monday, May 30th. Shoppers can save an extra 30-50% on clearance items. 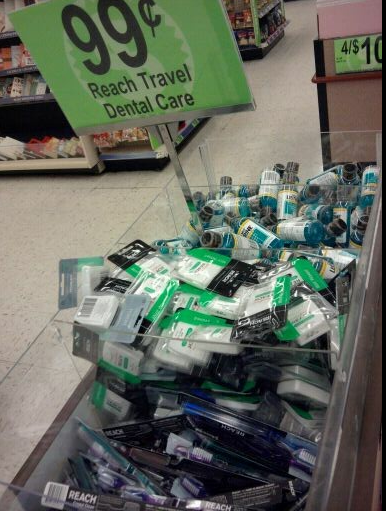 Attention Rite Aid shoppers! Rite Aid has revised their coupon policy and made some major changes. 1) BOGO FREE coupons can no longer be used on a BOGO FREE sale promotions. 2) Only one coupon can be used against a BOGO FREE sale promotion. 3) Only up to 4 identical coupons for the same number of identical items can be used. Go HERE to read the official updated coupon policy and print it out for future reference. 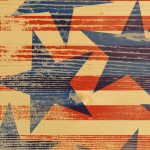 GRnow has put together a complete list of parades and Memorial Day festivities HERE. 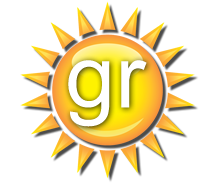 GrNow has put together a great list of festivals in West Michigan this summer. Go HERE to get the complete list and all the information. Tiny Prints is offering up another awesome promo! Go HERE to personalize a Thank You Greeting Card. Use the code TYOPRAH and this card will be absolutely FREE. You can choose to have the card mailed to yourself for FREE or you can have Tiny Prints mail it to the recipient for only the cost of the stamp. Michigan's Adventure is offering free admission for active or retired military on 5/30-5/31/11 and also on 7/3-7/4/11. Get more info HERE. Up for a giveaway is a Welcome vinyl wall word. It is black and measures 3.75" tall x 20". Perfect for your front door, wall in your entry way or any place around your home. One entry: Leave comment stating where you would hang the wall word. Pear Tree is offering a free kids stationary set shipped free to you. Go HERE. Just just enter in your email, click get my cards then view your cart and checkout. Hurry this offer will go quick! **Offer not valid on previous purchases or combined with any other offer. Promotion may end at any time based on Pear Tree Greetings’ sole discretion. 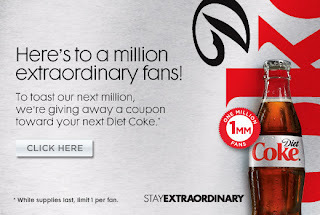 Offer ends when promotional item runs out or 05/23/2011 at 11:59 CST, whichever occurs first. Free shipping is only applied to the promotional item and not applicable to any other items in the cart. Limit one pack per person. Login or sign up on the Huggies site HERE and then choose to share the coupon by Facebook or email and you’ll be able to print a $3/1 Huggies coupon. Remember you can stack manufacturer coupons with store coupons and sales for additional savings. Go HERE to request a sample of Shout Color Catcher. While making a quick stop at the Grandville Walmart tonight, I spotted several racks of toddler and childrens clothing for $1 each. Boys and Girls starting at 18 month-5T, short sleeve shirts, polo shirts, long sleeve shirts, athletic pants, khaki pants, etc by Faded Glory and Garanimals. Lots of plain colors or stripes. Great play clothing. 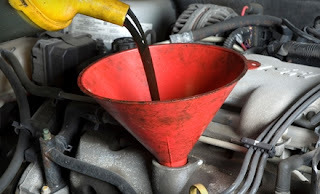 Groupon is offering today a $17 (reg $35) oil change at Performance Plus Quick Lube. This Groupon is good at one of 29 locations in West Michigan. See locations HERE. Check out all the info on this Groupon HERE. Also check out the Phillip Michael Salon and Spa Groupon- $19 for an express facial(reg $40) or haircut and makeup application(reg $55). The salon is located in Wyoming. Go HERE for more info. New to Groupon? Sign up HERE and learn about all the great daily deals Groupon has to offer. Best grocery deals below, find the entire ad HERE. 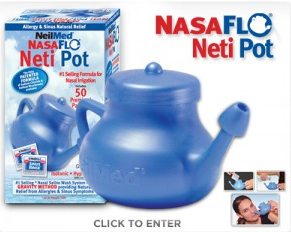 If you have not received this offer in the past, you can go HERE and “Like” NeilMed Neti Pot on Facebook to score a FREE NeilMed NasaFlo Neti Pot with two packets! Get a free one night rental at Meijer Redbox locations TODAY only when you use the code MEJER78. Get a free one night rental at Blockbuster Express when you use the code SPEEDWAY. This is only good at Speedway locations. Expires 6/30. Heads up for those with children. 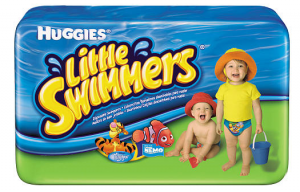 Starting next week May 22, Walgreens with have Huggies Little Swimmers for $2.99 each after coupons. With summer coming soon, this is a great stock up price! Rue La La: $20 expires May 25. Just a reminder that if you signed up for the $20 Rue La La credit a few weeks ago(no longer available), it does expire in one week-May 25. 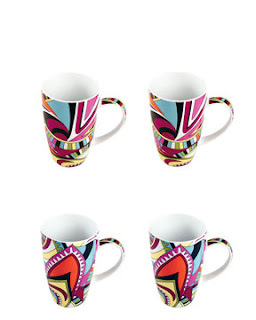 The Coffee Shop boutique has several items under $20, just pay shipping with your credit. Also the Reebok boutique has several shoes already 50% off. The Impulse boutique has some fun and funky serving pieces for under $20 as well. Like Bengamin Moore on Facebook HERE and request a coupon for a free pint of Benjamin Moore Arborcoat paint. 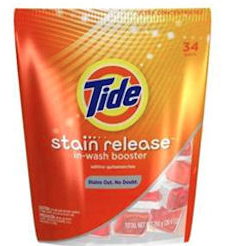 Starting today at 12:00 Noon request a sample of Tide Stain Release. This is a large sample. Hurry, only available to the first 20,000. Go HERE to request yours. Walgreens just released a hot new promo for the month of May. Buy Reach Toothbrushes between 5/16 – 6/12. 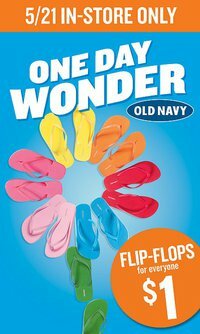 Old Navy will be offering $1 flip flops on Saturday May 21 for the whole family. Select Styles Only. While supplies last. Limit 5 per customer. In-Store only. 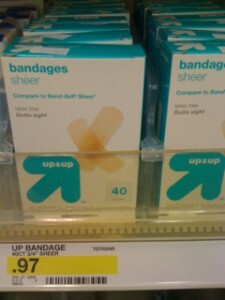 Target has a bunch of great Up&Up deals this week! FREE=3 Pure Drink Mix and 12pk of water! Its so easy! Leave a bag of non perishable food by your mailbox and your mail carrier will pick it up. All donations will be delievered to local food banks. More info HERE. Enter the Suave “Suave Smart Splurge Contest” and the first 100,000 people will also receive a coupon for a free Suave Naturals Body Wash or Body Lotion. Head on over and like Suave on Facebook HERE and click on the “Splurge Contest” tab. Blogger has been down the last 2 days. Sorry for the lack of posts. Lots of great deals to post today and tomorrow:) Stay tuned. Fulton Street Farmer's Market is now open. It offers locally-grown fruits and vegetables, plants and home-made arts and crafts. Reap the benefits and pleasures of freshly-picked fruits and vegetables, as well as hand-made items! Get a FREE Market Fresh Grilled Chicken & Pecan Salad with the purchase of 22 oz. Pepsi Beverage at participating locations. Go HERE to print coupon. Good until 5/15. 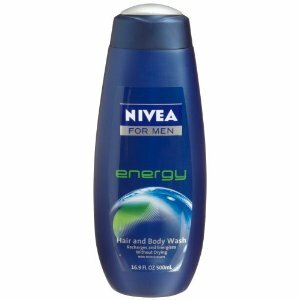 Mens Nivea body wash is on price drop for $3.99 at Meijer. 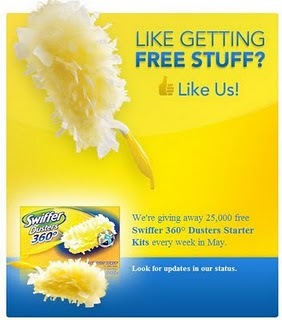 Starting today, Swiffer will be giving away 25,000 Swiffer 360 Duster kits. All you need to do is like them on facebook HERE and then look for their status update letting you know when the kits are available. Here’s a great deal! If you got in on that FREE $20 credit (no longer available) from Rue La La, you can go HERE and check out the “Stylishly Done Rainy Days” sale! You would be able to get a completely FREE kids umbrella shipped right to your door! Hurry, these may sell out quickly! *Also remember, you have to use your credit by 5/25! Now through May 7, get a free 8X10 collage print from Walgreens. Choose instore pickup and use code FREECOLLAGE at checkout. Go HERE to get started. 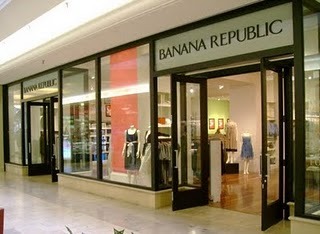 Today only until 2:00PM EST, take 40% off all full price Banana Republic womens items. Use code BRPOWER at checkout. ::Click on the “Earn Points” tab and take the Green Your Home Challenge, the P&G Future Friendly Challenge, the Dove survey or the Aveeno pledge to earn enough points to qualify for a free subscription. ::Click on “Get Rewards” and then “Music, Books and Magazines”. Choose the magazine you’d like to order and checkout. Magazine subscriptions start at 115 reward points.